1. 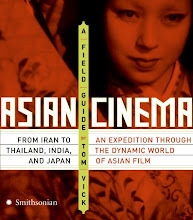 About Asian cinema exclusively. This is, in part, a form of self-therapy. Watching Asian films began as a hobby, then became a career, and now threatens to take over my life. Also, as a category, I'm not sure Asian cinema means anything anymore, or, rather, it means too many different things to too many different people. If I allow myself to use this space to write about movies from Iran and Korea, why not France and Senegal? Aren't each of these places equally similar and different, one from another? Following the same logic, why limit myself to film at all? If I admire both Hou Hsiao-hsien and Andy Warhol as artists, why not write about both? If I enjoy watching soccer and watching movies, why not include that as well? So without futher ado, welcome to my newly reconsidered blog, Asian Cinema Plus. We’ve had Thanksgiving at her home in Bethesda Md. since she got married and had kids. She refused to travel on her birthday, 6 hrs. to Ct.